We live in an ever faster and faster world. Most of us are constantly on the go and luckily for us, the Smartphone and tablet device technology and gadgets advancement has reached to such a point that we can now rely on our mobile devices to help us with a lot of things. This is even truer for business people who are often on the go and who need to stay in touch with other people at all times, as well as ensures they are not wasting their money or their time. 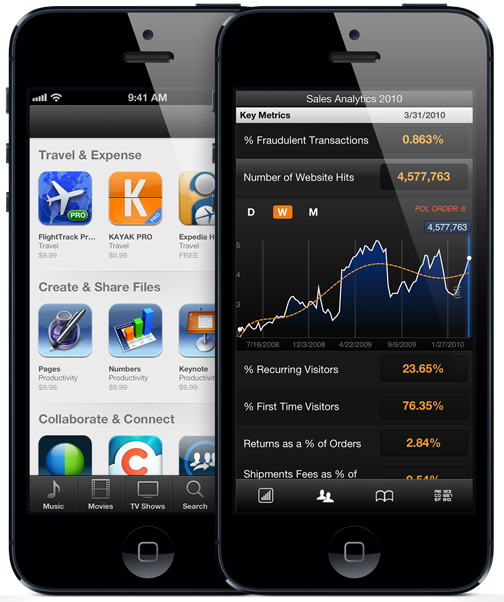 But, what are the absolute Top Five Best Business iOS Apps for iPhone, iPad and iPod Touch smartphone and tablet devices of today? OmniFocus is definitely one of the best smartphone apps for business people that you can get these days. This app is the closest thing you will get to have a personal assistant all of your own. It ensures that you know what you have on your plate every day and it enables you to organize your day and make sure you have everything under control. It also allows for cooperation between different people, sharing of all the important files and completing even the most difficult of tasks. More recently, OmniFocus has also become available for smart watches. When you are on the go, there are quite a few things that you need to be in control of. For instance, you need to be able to book your residential accommodation and vehicle transport as quickly and as easily as you want. You also need to make sure you are not wasting money and you need to be able to track all of your expenses while on business travels. Concur is, without a doubt, the best app of this kind in the world, able to do all of the above, and then some. Localeur is another app that is perfect for the business person on the go, especially if you are traveling to a number of different cities and towns regularly. The goal of this app is very simple – it makes you feel like a local everywhere you go. People who live and work in the city you are visiting are sharing their insights into their city and you can use this information to find the best hotels, restaurants, stores, etc. Almost all business people have a whole lot of files that they need to keep with them at all times, text files, spreadsheets, various types of analyses and so on. The best way to keep these available to you at all times is with a cloud storage service. Well, pCloud is such an app, giving you 20GB of free space and allowing you to expand this for a small fee. The biggest selling point of pCloud app, however, is the encryption methods it uses, ensuring that no one can access your files and steal them. Most business people also take meetings very often and when you are busy, it is easy to forget about them. With MobileDay, this is no longer a problem. This app syncs with your calendar that you have on your smartphone and notifies you about the meeting. In addition to this, it allows you to take the meeting with just one touch. In short, you will never miss a meeting, no matter where you are with MobileDay.